Pat Williams is a basketball Hall-of- Famer, currently serving as co-founder and senior vice president of the NBA’s Orlando Magic. As one of America’s top motivational speakers, he has addressed thousands of executives in organizations ranging from Fortune 500 companies and national associations to universities and nonprofits. Clients include AllState, American Express, Cisco, Coca-Cola, Disney, Honeywell, IBM, ING, Lockheed Martin, Nike, PriceWaterhouseCoopers and Tyson Foods to name a few. Pat is also the author of over 100 books, one of his most recent titled "Leadership Excellence: The Seven Sides of Leadership for the 21st Century." This book forms the basis for Pat's presentation on "Called to Lead." In the book, Pat has distilled a lifetime of leadership experience and study into key principles. Pat incorporates intriguing stories from Solomon to Steve Jobs--and provides insight and encouragement! His keynote presentation will do the same. 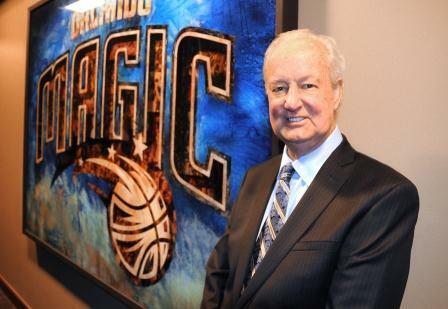 Pat has been an integral part of NBA history, including bringing the NBA to Orlando. He has traded Pete Maravich as well as traded for Julius Erving, Moses Malone, and Penny Hardaway. He has won four NBA draft lotteries, including back-to- back winners in 1992 and 1993. He also drafted Charles Barkley, Shaquille O’Neal, Maurice Cheeks, Andrew Toney and Darryl Dawkins. He signed Billy Cunningham, Chuck Daly, and Matt Guokas to their first professional coaching contracts. Nineteen of his former players have become NBA head coaches, nine have become college head coaches while seven have become assistant NBA coaches. Pat and his wife, Ruth, are the parents of 19 children, including 14 adopted from four nations, ranging in age from 30 to 44. For one year, 16 of his children were all teenagers at the same time. Currently, Pat has 15 grandchildren and counting. Pat and his family have been featured in Sports Illustrated, Readers Digest, Good Housekeeping, The Wall Street Journal, USA Today, and Focus on the Family as well as all of the major network and cable television news channels. Pat was diagnosed in February of 2011 with Multiple Myeloma. After several rounds of chemo treatments, Pat received a bone marrow transplant where the doctors injected him with almost 5 million of his own stem cells. Pat’s recovery from the stem cell transplant has been remarkable and the doctors are extremely pleased. While Multiple Myeloma is incurable the goal is to get the cancer into remission (Pat’s personal slogan has been “The Mission is Remission”); Pat’s doctors have told him that they are unable to detect any myeloma in his body and have given him a clean bill of health. Pat has accepted positions on several boards for different cancer groups, including an appointment on the Board of Directors for the Multiple Myeloma Research Foundation. Pat spends many hours each week responding to emails and phone calls of others affected by cancer, offering hope and words of encouragement. Pat was raised in Wilmington, Delaware, earned his bachelor’s degree at Wake Forest University, and his master’s degree at Indiana University. He is a member of the Wake Forest Sports Hall of Fame after catching for the Deacon baseball team, including the 1962 Atlantic Coast Conference Championship team. He is also a member of nine other hall of fames around the country.